A few scriptures that might help get the fire going as we come into the presence of God. We have to be sure, know, and truly believe that God is who He says He is before we come. God gives us the power to overcome every problem. We should realize that power. Jesus in his time of trouble said "Not my will but your will be done." God's will alone should be the forefront and focus of our prayer. Know that prayer is powerful and it has the authority to provide solutions. God's word gives direction that's vital to our "whole" lives. Whether we get it from the revelation that we receive in prayer or that from scripture. it's absolutely necessary to receive if we want to thrive. Entering into the presence of God doesn't have to be a struggle. 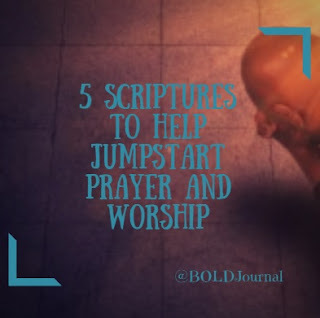 What are some scriptures that help get your fire started and moving as you pray and worship? Please share in the comments section below.